The complete 1940s & 1950s lifestyle and culture magazine for Music, Cars, Bikes, Fashion, Shopping, Pinups, Tattoos, Art & Burlesque. This month features Marilyn Munro, Ruby Demuir, Scene it on The Worlds Fastest Indian movie, and lots more. This month features hotrod Hayride, Vivien of Holloway, and lots more. 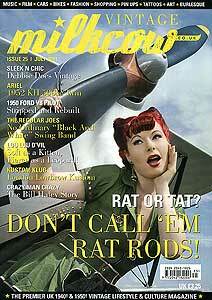 This month features the Bill Haley story, V8 Pilot, Rat Rods, and lots more. This month features the Lone Star hotrod show, The Rockolas, and lots more. This month features the Siren sisters, 1949 Royal Enfield, the history of skiffle and lots more. This month features the London International custom show, Buying your first hotrod, and lots more. This month features the king & queen of swing, Kustom Kulture, and lots more. This month features sax player Pete Cook, plus the new Hotrod Ramble feature, and lots more. This month features the NEC Classic car show, The Alley Cats, a BSA Wartime classic, plus lots more. This month features Goodwood Revival, Hemsby 45, plus lots more. This month features Twinwood festival, NASC Natonals, plus lots more. This month features Goodwood Vintage festival, The Hotrod Hayride, plus lots more. This month features the Rally of the Giants, Milkcow Meltdown, Jukebox Perfection, plus lots more. This month features the Goodwood Festival of speed, plus lots more. This month features the artwork of Ben Newman, plus lots more. This month features the Viva Las Vegas show report, plus lots more. This month features the award winning TV series Mad Men, plus lots more. This month features the crazt world of David Bell, plus lots more. This month features Jack Rabbit Slim plus lots more. This month features the photographic work of Dominic Romney plus lots more. This month features the hotrod art of Emma Ricketts plus lots more. This month features the Puppini Sisters plus lots more.